Which Gemstone is December's Birthstone? Unlike many other months, the month of December is somewhat confusing when it comes to identifying a birthstone. There are a number of stones that are linked with this festive month depending upon which culture you associate yourself with. For the purpose of this article we will focus on the gemstone turquoise; however, we will also touch upon other commonly referenced stones. Learn where turquoise comes from, the physical properties that identify it from other stones and the history of its use among various civilizations. As mentioned previously, there are a number of interpretations that are used to identify birthstones for each of the twelve months. Depending upon which of these cultural viewpoints you take one or all of these stones may hold significance. The various cultural interpretations of birthstones are numerous however, there are four that are most commonly utilized these include: the traditional birthstone method, the modern birthstone method, the mystical birthstone method and the Ayurvedic birthstone method. The traditional birthstone list is of gemstones that older society determined to be associated with specific months. There are multiple interpretations of this system of birthstone assignment which results in some degree of discrepancy since various social groups assigned different stones to different birth months based upon societal interpretation. The most commonly recognized gemstone for the birth month of December using this method is the bloodstone or the ruby. As time progressed and modern society set in changes were made to the accepted birthstones assigned to each month. These changes represented the changes in which gemstones were seen as fashionable and the meanings that had come to be associated with each stone. There are still a number of gemstones that are associated with being born in the month of December according to the modern birthstone method of assignment, these include: turquoise, zircon, tanzanite and blue topaz. The mystical birthstone system is one which is Tibetan in origin and dates to over one thousand years ago. The mystical birthstone list is one that references stones that ancient Tibetan society believed to bring luck to the individual who was born in a particular month if they wore their designated stone. The mystical birthstone system assigns the onyx as the birthstone for December. The Ayurvedic birthstone system is a system which assigns birthstones to individual months based upon ideas rooted in ancient Indian medicine and philosophy. The Ayurvedic system dates back as far as 1500 BC and is rooted in ancient Indian culture. According to the Ayurvedic system, the assigned birthstone for December is the ruby. 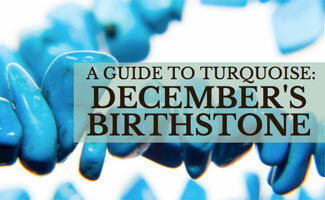 For the purpose of this article we are focusing on turquoise as the designated gemstone for the month of December. The reason we chose turquoise is due to the fact that topaz has been discussed at length under the month of November, Tanzanite is a rare and somewhat new gemstone and zircon is significantly less popular than turquoise as a birthstone. So what is turquoise? Turquoise is categorized as a phosphate mineral being that the chemical composition of this gemstone is rich in phosphate. The chemical equation for turquoise is CuAl6(PO4)4(OH)8·4H2O. Turquoise is also recognized as a hydrous phosphate of copper and aluminum by researchers and geologists. Turquoise is an opaque stone meaning that it cannot be seen through like many other gems such as diamonds. The blue-green color that this gem is most commonly known for is a thick rich color that has a density and strength that many people find appealing. There are many different shades of turquoise and each gemstone is as unique as another with varied markings and depth of color. Turquoise can be white in color which is surprising to many; it can also be blue-green, yellow-green and sky blue. The blue that turquoise is most commonly recognized for is a direct result of idiochromatic copper present in the stone. The term idiochromatic simply means that the copper is an essential constituent of the gemstone and it is this element that gives the stone its color. The green color that can often be seen in turquoise as well is generally a result of the presence of iron in the stone which replaces the aluminum but it can also be a sign of dehydration of the gem. Turquoise has been recognized as a valuable gemstone for thousands of years and in many cultures it is revered for its unique color and rarity. Turquoise is valued not only as a gemstone worn in jewelry (Like this Turquoise and Sterling Silver Roped Ring) , but it is also recognized for its beauty in ornamental stones as well. Turquoise is recognized as being one of the first gemstones to ever be mined and has long been seen as valuable but as turquoise mines become depleted the stone becomes increasingly valuable. Turquoise has been found all around the world in locations including Iran, Sinai, the United States, China, Afghanistan, Australia, northern Chile, north India, England and Turkestan. Of these locations Iran, Sinai and the United States are the most significant in terms of their contribution to the world’s turquoise supply. Turquoise has been found in Iran for the past two thousand years. So bountiful was the area in turquoise that many pieces of Iranian architecture include large quantities of turquoise, including Iranian palaces that used blue turquoise as domed roofs. The significance of this use for turquoise was actually nothing to do with the rarity or even the beauty of the gemstone itself, but more to do with the color. The blue color of turquoise was seen by the Iranian culture as a symbol of heaven on Earth and as such it seemed fitting for the palaces to be domed with such a divine color. Turquoise in Iran is obtained from the Nishapur region that is filled with mines as the turquoise supply is bled dry. Nishapur is located not far from the capital of the Khorasan province at the mountain peak of Ali-mersai. This is the single location for turquoise mining in Iran. Turquoise has been dated back as far as 3000 BCE in the Sinai Peninsula. The southwest coast of the peninsula is where all turquoise supplies in this region hail from, specifically from six individual mines. While all of these mines are important in their contribution to the turquoise supply, the two most bountiful of these areas are Wadi Maghareh and Serabit el-Khadim, the oldest of all six of the mines. The turquoise recovered from mines in Sinai is somewhat unique to the area in that it is the most translucent of all turquoise samples seen worldwide. When magnified the surface of turquoise from the Sinai area shows to have dark blue discs that cannot be seen on other turquoise samples from regions other than Sinai. One of the biggest regions known for its turquoise production is the southwest United States, more specifically: New Mexico, Arizona, Colorado, California and Nevada. Of all of these mining areas for turquoise, the oldest of them all is believed to be that in Cerillos, New Mexico. Many of these American turquoise mines have been mined since the Native Americans inhabited that land and over time many of them have become completely depleted. Before the 1920’s the Cerillos mine of New Mexico was known for producing the country’s largest quantity of turquoise; however, today, the mine stands nearly completely depleted and is unable to operate at a commercial capacity. Unfortunately the same fate has befallen a large number of the North American turquoise mines and to date only one mine in Apache Canyon, California, remains able to operate at a commercial capacity. Unlike the unique and brilliant turquoise commonly found in the Sinai Peninsula, the turquoise found in the United States is often of a particularly low-grade. American turquoise often presents with chalkiness and green and yellow discolorations that result from high levels of iron in the gems. Not all American turquoise is of poor quality however, and many of the deposits that are recovered from Arizona are recognized as being some of the world’s highest quality specimens. The most unusual mines found in Arizona in terms of the gemstones that they produce are the Sleeping Beauty mine and the Kingman mine. Over the years turquoise has played a significant role in a number of cultures including the Ancient Egyptians, Aztecs, Indus Valley civilizations, Mesopotamians, Persians and the Chinese. Many civilizations were attracted to turquoise through its color alone; however, although it is known for being one of the world’s oldest gemstones it was not until the 14th century that turquoise began to play a significant role in the Western world. The importance of the 14th century in the use of turquoise in the Western world comes down to the influence of the Catholic Church. It was not until the 14th century that the Catholic Church allowed for the gemstone to be utilized in secular jewelry. Each culture that utilized turquoise in some form or another ascribed their own beliefs to the power of the gem but one that was particularly prominent was the idea that turquoise held protective qualities. For a wearer of turquoise the stone would protect against outward forces and also change color as the health of the wearer began to decline or otherwise change. Unlike many gemstones turquoise is slightly easier to identify in that it has such unique physical properties, most particularly the color. It is still important however, that researchers and geologists be able to identify a gemstone accurately and to do so they rely upon a number of elements. These identifying agents include: Strunz classification, crystal habit, crystal system, cleavage, fracture, Mohs scale value, luster, streak, specific gravity, refractive index, birefringence and solubility. The Strunz classification system is a method used to categorize different minerals based upon their chemical composition. The Strunz classification of turquoise is 08.DD.15. The 08 section of the Strunz classification code indicates that turquoise is recognized as being a phosphate, arsenate or vanadate. We know from this article that turquoise is a phosphate mineral. The first letter D is used to identify the Strunz mineral division, the second letter D is used to identify the Strunz mineral family letter. The number 15 is used to identify the particular mineral or group number. The term “crystal habit” is used to reference the overall external appearance of a mineral. The crystal habit of turquoise is massive and nodular. The crystal system of turquoise is triclinic. The triclinic crystal system is just one of seven different crystal systems and is identified as being a crystal that has vectors or unequal length. There are two classes of triclinic crystal systems: pedial and pinacoidal. The term cleavage when used in reference to a gemstone is used to describe the tendency of a mineral to split along specific structural planes. When discussing turquoise the cleavage of the stone is generally referred to as being good or perfect. The term fracture in mineralogy is used to reference the texture and shape of the surface left behind when a mineral is fractured. There are a number of fracture patterns that are shared by any number of gemstones. The fracture pattern for turquoise is referred to as being conchoidal. A conchoidal fracture pattern indicates that when fractured turquoise will have a curved surface that is characterized by concentric ripples such as those that can be found in a mussel shell. The Mohs scale is a scale that is used in mineralogy that references the particular hardness of a stone. The Mohs scale runs from a value of one which represents the softest stones to ten which represents the hardest stones. An example of the softest stone on the Mohs scale is talc which measures in at a one. An example of the hardest stone on the Mohs scale is the diamond which measures in at a ten. Turquoise measures in at anywhere from a five to a seven on the scale depending upon the individual stone sample. The midrange value or turquoise on the Mohs scale means that the stone can be easily fractured. The luster of a gemstone is the description of how light plays on the surface of the gemstone. There are a number of terms that are applied to gemstone luster. The luster of turquoise is described as being waxy to subvitreous. A waxy luster is exactly as it sounds – the surface of the gem appears as though it is made from wax as the light plays across it. The term “streak” when used in reference to a mineral is used to describe the color of the residue left behind when that mineral is dragged across an unweathered surface. The streak of a mineral is not always the same color as the mineral itself. The streak of turquoise appears bluish white in color. The specific gravity of turquoise is 2.6-2.9. This measurement compares the ratio of the density of turquoise to the ratio of the density of a reference substance which for most purposes is water. This means that turquoise has a density that is 2.6 to 2.9 times higher than the same volume of water. The refractive index of a mineral is a reference to the speed of light as it passes through the mineral in question. The refractive index of turquoise varies on the wavelength of light that is used, the values in the case of turquoise are as follows: nα = 1.610 nβ = 1.615 nγ = 1.650. The term birefringence is a term used to refer to the decomposition of a light ray as it passes through an element. Depending upon the material that is being tested light rays will decompose at varied rates. The birefringence rate of turquoise is +0.040. The term solubility refers to the ability of a material to dissolve in a substance to create a homogeneous solution. The solute, or the material being dissolved, can be dissolved in any number of liquid, solid or gaseous solvents. Depending upon the material not all substances are soluble. Turquoise is soluble in hydrochloric acid. Want to Learn the Meaning of Turquoise? Check out this short 2 minute video of the meaning of turquoise. Turquoise is a particularly fragile gemstone in many ways, not only because of the ease with which it can be fractured but also due to the susceptibility of this stone to be affected by outside substances. Turquoise jewelry is particularly susceptible to being exposed to perfumes, colognes, detergents, soaps and other harsh substances which can destroy the finish on a piece of turquoise jewelry as well as alter the original color of the gem. With the proper care however, this beautiful gemstone is a unique one of a kind gift that is the perfect accent piece to any formal affair or simply a day out at the mall. What gemstone do you associate with the December birthstone?